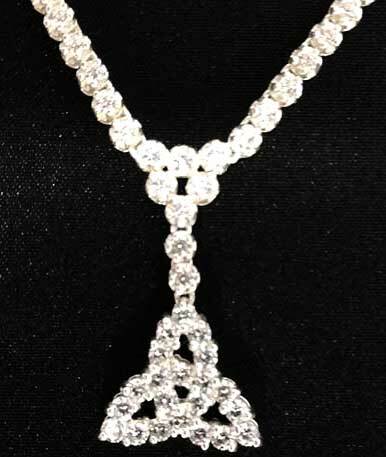 Celtic necklace is fashioned in sterling silver and features a CZ stone studded Trinity knot charm and chain. 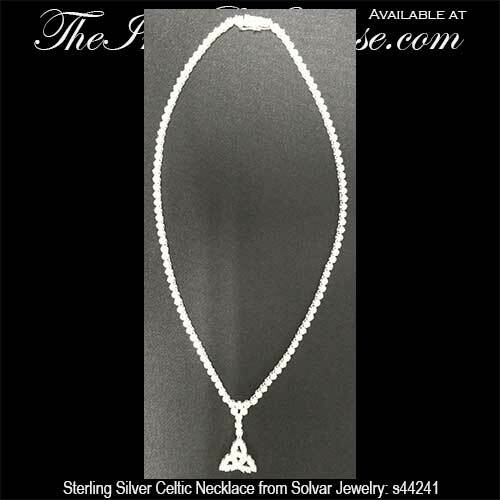 This sterling silver Celtic necklace features CZ stones studded in the Trinity knot pendant along with the entire length of the 17" long necklet chain that is complete with a locking hasp. The Trinity pendant measures 5/8" wide and is made by Solvar Jewelry in Dublin, Ireland. The necklet style Trinity is gift boxed with a Celtic knot history card, complements of The Irish Gift House. These sterling silver Celtic drop earrings feature CZ stone studded Trinity knots. These sterling silver Celtic stud earrings feature Trinity knots with CZ stones.